Associated Press Toronto Maple Leafs center Auston Matthews reacts after scoring the go-ahead goal Monday in Boston. 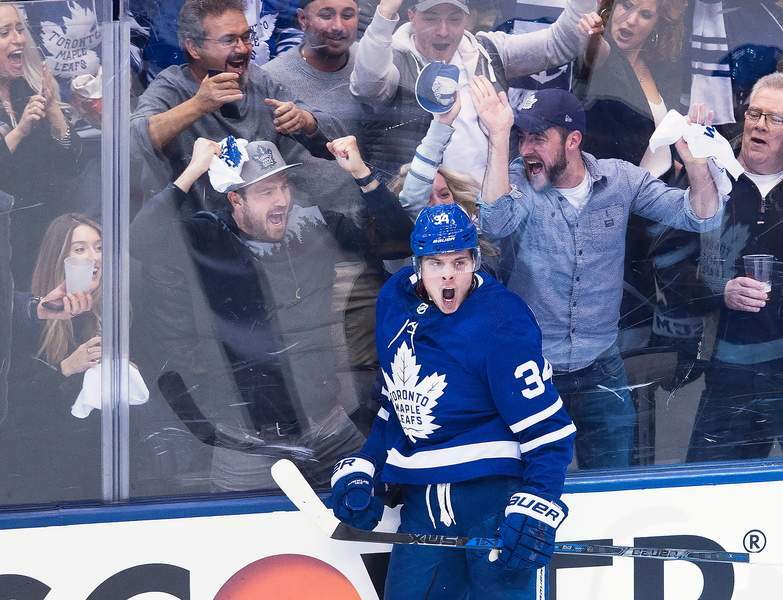 TORONTO – Auston Matthews scored the go-ahead goal in the second period, Patrick Marleau had two goals, and the Toronto Maple Leafs beat the Boston Bruins 4-2 on Monday night in Game 3 of their Eastern Conference first-round series. James van Riemsdyk also scored and Mitch Marner and Morgan Rielly added two assists each to help Toronto pull to 2-1 in the best-of-seven set. Frederik Andersen stopped 40 shots. Boston's top line of David Pastrnak (four goals, five assists), Brad Marchand (one goal, five assists) and Patrice Bergeron (five assists) totaled 20 points through the first six periods of the series while also holding Matthews and Toronto's top unit off the scoresheet. But the Maple Leafs finally had an answer on this night as the Bruins' trio failed to find the range. The Boston power play – which went 5 for 10 in the first two games – got its first opportunity early in the third, but Pastrnak hit the post off a feed from Rick Nash. DEVILS 5, LIGHTNING 2: In Newark, N.J., Taylor Hall had a goal and two assists, setting up Stefan Noesen's game-winner with 7:05 play. Game 4 of the best-of-seven series will be Wednesday night in New Jersey. Hall skated down the right boards, avoided a check by Tyler Johnson and found Noesen in the left circle with a cross-ice pass that the forward one-timed past Vasilevskiy to take the early lead.